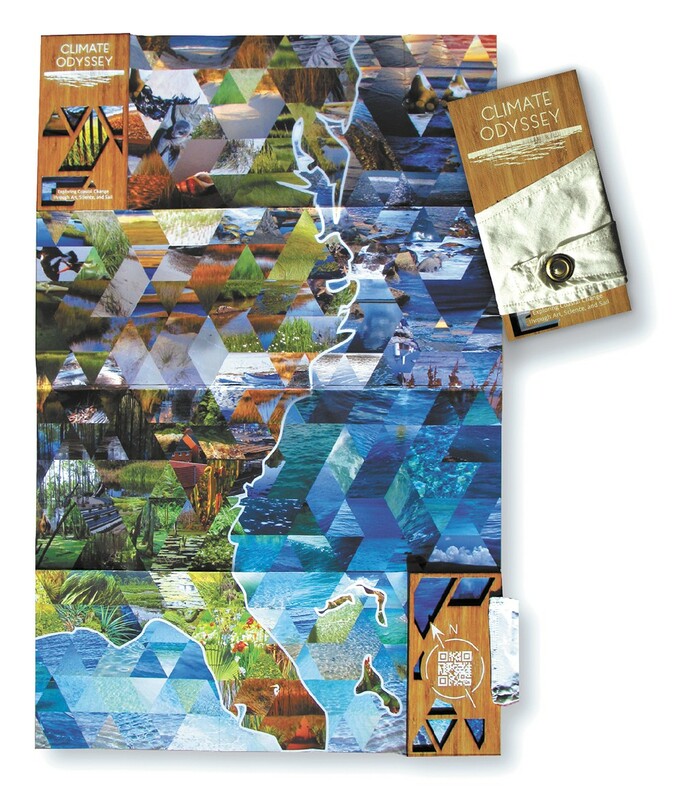 A mockup of the proposed Climate Odyssey book (above and bottom left) by Zion Kols and Lucy Holtsnider (bottom right). Zion Klos is a hydrologist wrapping up a Ph.D. at the University of Idaho. Lucy Holtsnider is a visual artist with a thick portfolio of multimedia creations. Somehow these two are going to work together to help save the world. It's ambitious, sure, but first, they're going to get married to each other. The couple, who've lived in Moscow for the past three years, are heading out on the ocean for a project they're calling Climate Odyssey. The plan is to travel from the Great Lakes to the Atlantic Coast and then down to the Caribbean, researching and documenting the effects of climate change and investigating how different communities are dealing with our changing planet. They'll also visit schools and provide other educational seminars along the way. "It's a surprising collaboration. We definitely realize that," says Holtsnider, 26, who made a splash in Moscow with her commissioned illuminated sculpture series called Moscow Light Houses. Klos, whose doctoral work has focused on hydrology and climate change as well as aspects of social sciences, has spent much of his time at the University of Idaho holding workshops in areas throughout the Inland Northwest and northern Rockies, educating residents about climate change. There's no shortage of research on the subject, but to get the point across, they need someone like Holtsnider, who can turn that empirical evidence into photographs, illustrations and ultimately a map-like book that will document their experiences on the trip. "Through art, there's a better emotional response and engagement, and we're actually going to share the science more effectively. What I've done before is just throw out the graphs and figures and see how people respond," says Klos, 27. "And that doesn't work for everyone." When Klos was in middle school, his parents sold their dairy farm in Wisconsin and did something the rest of the extended family thought was a little crazy — they sailed the world. OK, maybe not the world, but Klos, his parents and his sister boarded the family's simple wooden vessel and headed down the Mississippi and into the Gulf of Mexico and then on to the Caribbean. They didn't head back north until a year and a half later, the sailboat serving as their classroom all the while. "We learned algebra by learning to navigate with a map and a compass and we studied languages by going to Spanish-speaking countries," Klos says of the adventure that also introduced him to natural science and started him on a 15-year journey of education. His parents soon started new careers, and Klos headed off to Colorado College (where he met Holtsnider), then around the world with his research. The boat has been sitting next to his parents' barn all this time, but this summer Klos and Holtsnider will put the it back in the water and, like his parents before him, do something a little crazy. The art of Lucy Holtsnider, which is to accompany the scientific reasearch of her soon-to-be husband, Zion Kols. Funded by grants and an ongoing Indiegogo campaign (search "Climate Odyssey"), the couple plans to rehab the vessel and get it in sailing shape by early summer, at which point they'll head off for a year. Klos, who will teach his new wife the literal ropes of sailing along the way, says they won't venture more than a day from shore, which is where most of their work will be done, anyway. Some coastal communities have already adapted to changes in their climate, but others, even in the U.S., aren't as prepared, Klos says, due to a lack of resources (which is the case in impoverished Caribbean areas) and also a lack of awareness or even apathy concerning the issue. "We'll be going into schools and holding forums with nonprofits to share this climate info on a local scale," says Klos. Klos spends most of his time talking to people in our region about climate change. For example, he was recently in Lewiston, Idaho, addressing a group of logging contractors. When he uttered the words "climate change" he saw the already tough expressions of his audience further roughen. But as he talked about the everyday evidence these guys had seen in the forest over the past couple of decades, they warmed up. "They came up and said that they don't like climate change and don't like the politics, but they see the changes happening," says Klos, who has also studied the psychology surrounding our understanding of climate sciences. The politicization of climate change has made it a tough subject to communicate, especially in a time when our elected officials are bringing snowballs to the floor of the U.S. Senate as alleged proof that the world is not warming, and at least two states, Florida and Wisconsin, have made it illegal for their agencies to even use the term "climate change." That's where Holtsnider can help. "We're hoping to have somebody who doesn't like science see this piece of art or photographs and connect to that, and then go to out and learn more for themselves," she says. The couple knows they aren't going to stop climate change with merely a year at sea. 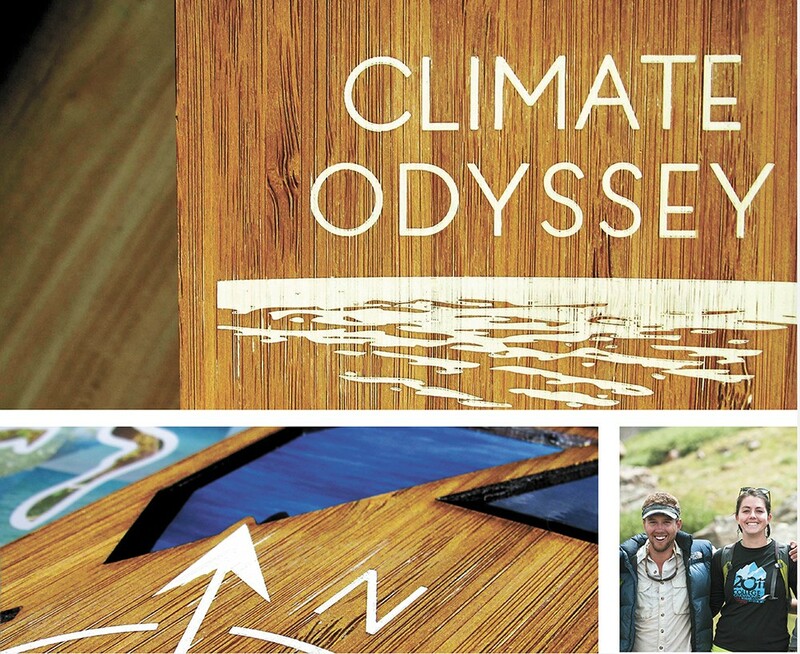 But they hope that Climate Odyssey continues on long after that, with visits back to the Caribbean, where they ultimately plan to donate the boat to a local nonprofit which can put it to good use. Their efforts might be a drop in the bucket — or ocean — when it comes to preserving the planet, but they'll at least know they tried.